Have you seen these cute little containers of chocolate covered cocoa nibs? I'd heard of them before, but I had never been lucky enough to actually find them until a few weeks ago when they popped up right next to the cash register at Whole Foods. The sweet riot chocolate covered cocoa nibs are really fabulous, and as much as I adore the other dark chocolate cocoa nibs I've blogged about, I have to say the one serving size container these come in also makes them really cool! What's also cool about the container is that you can re-use it by filling it with small one size servings of nuts, other treats, or even more coca nibs. In case you've never had the pleasure of eating a cocoa nib before (I'm just starting to see them showing up more often on shelves in natural food stores like Whole Foods), it is basically a small, bitter piece of chocolate, kind of like a coffee bean. Cocoa nibs are actually roasted cocoa beans, and have a really subtle chocolate taste and flavor. That is why they are awesome when they are covered with chocolate -- similar to eating chocolate covered espresso beans. 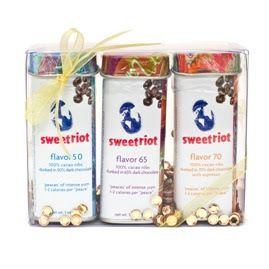 The sweet riot cocoa nibs come in three flavors: (1) flavor 50 - cocoa nibs covered in 50% dark chocolate, (2) flavor 65 - cocoa nibs covered in 65% dark chocolate, and (3) flavor 70 - cocoa nibs covered in 70% dark chocolate with a hint of espresso. Flavor 70 is my favorite, although if you don't like the bitter taste of really dark chocolate, you might want to try flavor 65 or flavor 50. All of the cocoa nibs are dairy free and gluten free. As it says on the package, what exists inside are "pieces of intense yum with 1-2 calories per piece". If you were to eat all of the cocoa nibs in the container (it is one ounce -- with more than a hundred cocoa nibs inside, so a container should last a few days), you would be eating approximately (depending on the flavor) 140 calories, 12 grams of fat and 4 grams of fiber, or 3 weight watchers points. If you can't find the sweet riot cocoa nibs in your local store, you can still try out other brands like the Kopali dark chocolate cocoa nibs which are equally as delicious (just not available in the adorable one serving container). By the way, for those of you with questions about food, diet, nutrition or my thoughts on healthy eating, you can now email them to me at questions@yummydietfood.com. I'll make sure to answer your questions in future postings, or just via email if you prefer. These have been in one of my markets for awhile, but I have yet to try them. I do love cocoa nibs though. My favorite chocolate bar, from Scharffenberger, has cocoa nibs in them. They're addictive! Looks like a nice addition to the Fage yogurt as you previously mentioned. It takes forever for us in Upstate to get this kind of cool product but I'll be on the look out. these look soo yummy!! i love cacao nibs. i eat them all the time sprinkled on fruit. i think i've seen these by the cash register at this one bookstore. i haven't tried them, but i'll get some next time. Ooh tasty! I'd never heard of those. You have so many good finds.